Intel Edison measuring USB voltage on breakout board | Michael Hirsch, Ph.D. I have been trying out a variety of power sources. One is the 4xAA battery holder to female USB Verbatim 97928 available for about $10. It seems to have a well regulated 5.0 volt output. 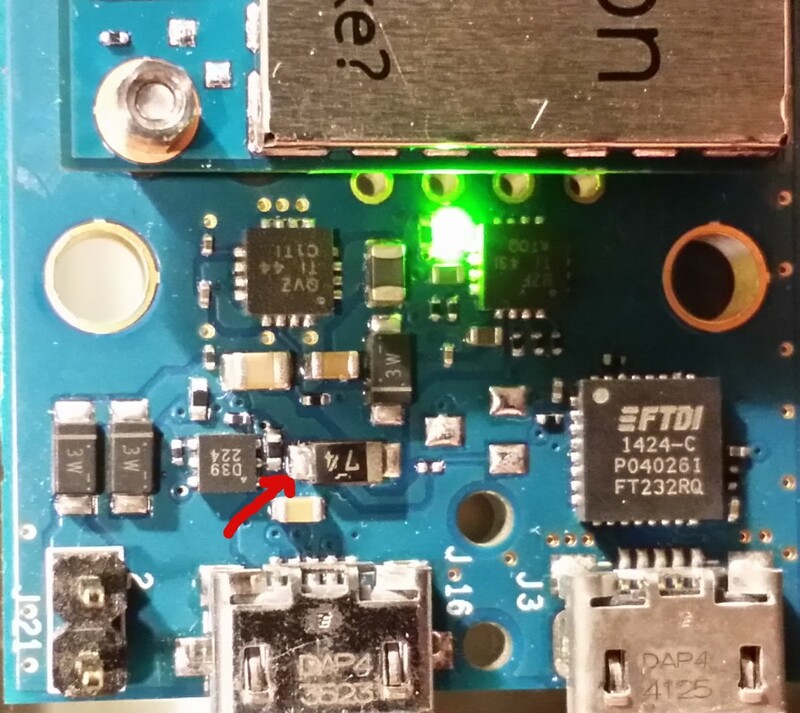 The red arrow points to the side of the “74” diode that comes right off the micro USB connector. I measured 5.00 V there with the Edison running on the Verbatim 97928. On the other side (downstream) of the diode I measured 4.72 V with the Edison idling. This voltage drop is expected due to the forward bias diode voltage drop. Under 100% of one core CPU load, I measured 4.98 V on the USB side, and 4.66 V on the Edison side of this diode while powering from the USB port on the Verbatim 97928. The minuscule apparent 20mV voltage drop on the battery/USB side of the diode is likely to come from ohmic losses in the USB connector and cable. I estimate 10-12 hours of battery life on four AA alkaline batteries assuming continuous 100% CPU of one of the two CPU cores (other core idle). Normally the Edison will be mostly resting, drawing perhaps 100 mW. Thus with mixed use, I might expect up to 4-5 days of continuous mixed use operation on 4xAA batteries for the Intel Edison.